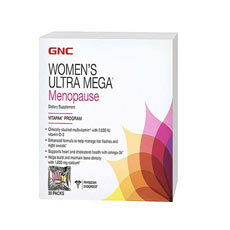 What is GNC Women’s Ultra Mega Menopause? GNC Women’s Ultra Mega Menopause is an advanced dietary supplement, which combines a unique blend of ingredients that aid in relieving the menopause symptoms. The ingredients used are clinically studied and proven to be safe. This formula woks in various ways to make you comfortable as you go through the menopause period, and help you in managing the signs associated with menopause. 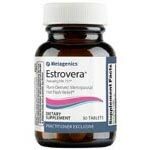 The main function of this supplement is to relief you from menopausal signs like night sweats, hot flashes, vaginal dryness, irritability, mood swings and insomnia. Using this supplement will supply your body with calcium, which helps to improve the bone health and make you strong. It will also serve you with other health benefits like controlled cholesterol levels, and improved cardiovascular health. Continuous use of this product will improve your body overall health. If you are interested in buying this formula, you can order it via retail traders. Who is the Manufacturer of GNC Women’s Ultra Mega Menopause? This formula is made by a company called GNC. It Uses clinically proven ingredients which are unique and of high quality. This supplement claims to increase the body calcium levels, improve bone health, increase body strength and provide an instant relief from the common menopausal symptoms. It also regulates blood cholesterol and improves cardiovascular health. This product works reduce the sufferings experienced during menopause and improve your body health. It supplies calcium in your body, making you to develop healthy and strong bones and prevent you from osteoporosis. It also helps to balance hormones and relief you from night sweats, hot flashes, irritability, mood swings, anxiety, vaginal dryness and insomnia. Consistent intake of this supplement will help to control your blood cholesterol levels and improve the cardiovascular health. The ingredients used are clinically studied and proven to be safe. Omega 3 fatty acids – Controls the cholesterol level and improve cardiovascular health. Primrose oil – Helps in hormonal balance. Soy isoflavones – Reliefs from night sweats and hot flashes. Black cohosh – Prevents hot flashes. Calcium – To improve bone health. What are the Advantages of GNC Women’s Ultra Mega Menopause? What are the Disadvantages of GNC Women’s Ultra Mega Menopause? The dosage of ingredients is not indicated. Where can one buy this formula? This product is available from the leading online retailers. GNC Women’s Ultra Mega Menopause is a unique supplement which helps you in managing menopause symptoms and provide you with other health benefits. It supplies your body with calcium, making you to be strong and improve the bone health. Regular intakes of this formula will relief you from hot flashes, night sweats, anxiety, irritability, insomnia and mood swings. It will also help to control the level of cholesterol in your blood and improve cardiovascular health. This formula is recommended for use by women during the menopause period, to reduce the severity of menopause symptoms. It will effectively help in balancing hormones and enable you live a normal life like there before. This formula is made using a unique blend of ingredients, which are clinically studied and proven to be safe and effective.